Ever wonder about your family history? Maybe how your family emigrated to America or even who your notable relatives are? Ancestry research tools are becoming more available online, encouraging many to dive into their family history. After recording the basic information of for your immediate family, what’s next? 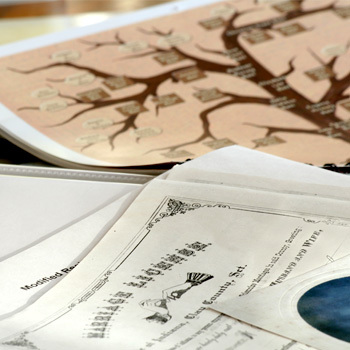 Many genealogy experts recommend beginning with the final chapter—the record of an ancestor’s death. Death records are a great resource and are usually available to the general public. If you haven’t yet used death records in your ancestry research, here’s what you need to know to get started. The death certificate is a primary source for the details of an ancestor’s passing, such as the date, place and time of death. It also can be a rich source of secondary information for an ancestor’s life, providing clues to everything from birth and parents to spouse and last residence. The names you find in a death record can possibly lead you to other relatives, or perhaps even uncover another generation of your family. The name of the informant on the death certificate could also be exactly the clue you need to solve a maiden-name mystery. The residential address listed can aid your search in census records, city directories or land records. Besides just filling in blanks in your family tree, dates can point you to other records, such as newspaper obituaries, passenger records or other vital records. Even the cause of death could help in building a medical family history or prompting a search for newspaper articles about the fatality. Obtaining death records depends on when and where the records were generated. Most states did not require death records to be kept until the mid-19th century to early 20th century. If the record you want falls within this time period, you can usually find it at the state department of vital records (fees vary from state to state). Although privacy restrictions more commonly affect the availability of birth records, you may run into similar roadblocks with death certificates. Some states keep death records private unless you are an immediate relative. Death records can usually be obtained at the health department or vital records office in the county that the death occurred. The same records available at these locations can also be ordered through third-party businesses such as VitalCheck. A handful of states provide online access to digitized death records. You may also find your ancestor in a death index that was compiled by someone doing their own ancestry research. The popular Ancestry.com uses a death index where you can then request the actual death record. Other substitutes include: contacting the funeral home in which the service took place, searching through local newspapers, asking churches for records of death of their members, coroner records and military records. One way or another, your ancestor’s final chapter is out there for you to read. Although documentation was limited in the past, there is a trail of your ancestry; you just have to find it.